To provide you with the best possible accelerated experience, Firebrand Training maintains partnerships with industry leaders in information technology and education. Firebrand Training is a member of the Association of Employment and Learning Providers (AELP). Membership of the AELP means that the interests of Firebrand and its apprentice employers are represented at a national level. The AELP represents over 840 organisations responsible for the delivery of over 75% of the apprenticeships in England. Firebrand Training is a Microsoft Silver Partner for Learning. Our Silver Partner status provides us an early insight into Microsoft development and strategies, which helps to improve our products even further. Firebrand Training is an Official Cisco Learning Specialized Partner. This means Firebrand is authorised to deliver official Cisco training by Cisco approved trainers. Firebrand Training is an Authorized Partner of the Computing Technology Industry Association (CompTIA). This means Firebrand have access to the latest official curriculum and the best instructors. CompTIA helps shape the technology community with programs that set standards and guidelines today and into the future. CompTIA offers vendor-neutral certifications including the A+, Network+, Linux+, Server+ and more. Firebrand Training has joined the International Information Systems Security Certifications Consortium (ISC)2 as a host partner. (ISC)2 is the major security association worldwide that helps companies recognise organisations and individuals who are knowledgeable in security through a large portfolio of certifications, including the renowned CISSP. 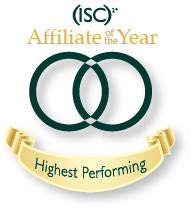 Firebrand has been named as “Highest Performing Affiliate of the Year – EMEA” by (ISC)2. The major security association helps companies recognise organisations and individuals who are knowledgeable in security through the CISSP, CCSP, CSSLP and SSCP certifications. Firebrand Training is an EC-Council Accredited Training Center (ATC) and Partner (ATP). EC-Council Accredited Training Providers (ATP) deliver the hands-on instruction e-Business professionals need to become proficient in building, deploying, and maintaining e-Business projects. Training Partners are certified to teach each of the authorised curricula for e-Business technologies. All partners are carefully selected and screened and have met EC-Council's high standards in instructor certification, course delivery, adherence to training facility requirements, and ongoing quality commitment. Firebrand Training has won the EC-Council Accredited Training Centre of the Year Award. Firebrand Training is a PECB Platinum Partner. This Platinum partnership designates outstanding, “one of a kind”, partners who have excelled at providing PECB certified training courses. Firebrand Training is an officially accredited PRINCE2 training provider. Firebrand Training is a Novell certified partner, specialising in training students in Linux administration techniques. The LATP Program differentiates and substantially increases the objective standing of training organisations by showing a higher level of commitment to LPI. This is shown through the use of third party-approved training materials, LPI certified instructors and adherence to LPI's Training and Academic Code of Ethics. OTA provides the most comprehensive, vendor neutral, hands-on RFID training curriculum available on the market. Their courseware and instructors enable everyone from novices to experienced technical professionals to develop their RFID knowledge. OTA's classes address various aspects of RFID technology and implementation, as well as prepare for CompTIA RFID+ certification. OTA’s proven E3 Learning System guarantees effective, engaging and easy to follow training. TruSecure Corporation has set the standard for risk mitigation in increasingly complex and interconnected business environments. A global leader in managed security services, TruSecure helps organizations ensure the security of critical business information assets. Firebrand Training's accelerated TICSA training programs are authorised by TruSecure Corporation, incorporating the TruSecure philosophy and methodology into program delivery. Firebrand Training is a CIW Authorized Training Partner, guaranteeing officially approved course material and quality instructors. Firebrand Training is an authorized VUE testing centre, administering tests to students on-site during their accelerated training courses. VUE is an electronic testing, course registration and training administration division of NCS. From operational centres in the United States, Australia and the Netherlands, VUE provides a variety of services to the IT training industry. The UK Register of Learning Providers is a 'one-stop' portal be used by government departments, agencies, learners, and employers to share key information about learning providers.